For larger properties, it can be nerve-wracking to let your dog out to roam. Even the most trustworthy dog can get distracted and wander too far for comfort. If you’re looking for ways to let your dog roam without feeling unnecessary anxiety, you may want to see if an electric dog fence is the right solution for you. First, it is important to understand how you and your dog should use and interact with these fences. Your perimeter should surround the desired area completely without any breaks to prevent your pet from escaping. If necessary, you may need to rent a trencher to help lay the wire under the ground, walkways, etc. If your dog loves to dig, you’ll want to make sure the wire is laid down deep enough that it cannot be uncovered, damaged, or dug under. If you are laying your wire aboveground, use lawn staples or other arrangements to prevent unnecessary movement and reduce tripping hazards. In addition, you will have to decide if there are any other fences or borders to take into consideration. A simple garden fence will not cause any trouble, but electrified fences for preventing deer and other animals from entering your property must be carefully considered. Your dog fence should be 10 feet away at minimum from any other electrified wire fences at all points along the perimeter. This is to prevent arcing and interference of any kind that can harm you, your pet, and/or the vegetation around your perimeter. Consult all safety manuals for all electronics and machinery that will be used near the perimeter to be sure all safety recommendations are satisfied prior to starting your installation. Unlike other electric fences, the energized wire signals a small collar unit that delivers a mild shock, often compared to a moderate shock from static electricity, before the dog reaches the border. The best way to take advantage of this set-up harkens back to Pavlov’s dog experiments. Once your fence is set up you will want to familiarize your pet with the boundaries of their play area. Before they cross the boundary or trigger the shock, call them back to you. As you and your dog interact within the perimeter of the yard they will become familiar with their new allotted territory and eventually will naturally avoid the fence. No one knows fencing, wire, and electricity better than Farm Supply Store, owned and operated by Jason Governo out of Barnesville, GA. 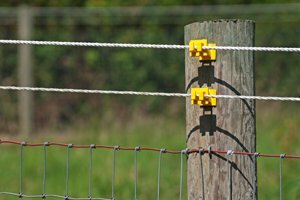 Check out their wide variety of high-quality products, from horse fencing to electric fence chargers, online today at farmsupplystore.com/.